I have tried product after product trying to find the perfect cream, serum or other miracle cure over the counter to stop aging and even reverse the signs of premature aging. I have used products that offer a subtle change but nothing has been as drastic as what I saw after I received my first Botox treatment three years ago. I tried it once more before I became reluctant in continuing its use. I've often wondered about the various treatments, fillers and injections that are offered but have not had a chance to investigate further. Megan Brown, Light Years Ahead, was able to virtually introduce me to Edgar F. Fincher, M.D., Ph.D. I was delighted to have the opportunity for a question and answer session. Dr. Edgar F. Fincher received both his MD and PhD degrees from The University of Tennessee, Memphis. He then completed early training in General Surgery at Stanford University followed by a research fellowship, also at Stanford University, where he studied mechanisms of skin wound healing. Dr. Fincher then completed his Dermatology residency at Stanford University before relocating to Los Angeles for a Fellowship in Mohs micrographic surgery, laser and cosmetic surgery. 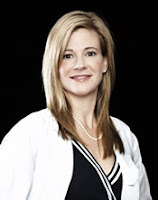 Dr. Fincher's areas of expertise include the treatment of skin cancers using the Mohs surgery technique, facial plastic reconstruction following skin cancer removal, laser treatment of the skin as well as cosmetic surgery (facelifts, eyelid surgery and liposuction). Dr. Fincher has conducted extensive research into the mechanisms by which the skin heals and utilizes this information to create a superior surgical outcome with minimal scarring. 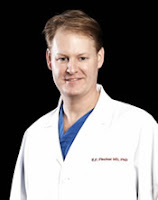 Dr. Fincher has conducted numerous presentations about his surgical techniques and laser research at national meetings for dermatologic surgeons, facial plastic surgeons and laser surgeons including work on the use of cutting edge lasers for skin rejuvenation, suture lifts for facial lifting and the combined use of liposuction with Thermage for maximizing neck rejuvenation. By offering a wide range of treatments and the latest cutting edge technology, Dr. Fincher is able to tailor make the ideal surgical treatment for the individual patient and to provide a variety of laser techniques to ensure the ideal outcome following either cosmetic surgery or facial reconstruction after tumor removal. Dr. Fincher and his wife, Dr. Helen Fincher, practice out of the Fincher Dermatology and Cosmetic Surgery in Beverly Hills, California. They provide many services and products and I saw they offer Dysport which is the latest competitor of Botox. One of the factors I have looked for before trying to decide on a procedure or a dermatologist, are the pictures. Fincher Dermatology and Cosmetic Surgery offers before and after photos of facelift, facelift with chin implant, blepharoplasty, necklift and liposuction. If you've ever wondered about the various products and procedures available, Dr. Finchers' site is perfect for educating yourself. Each product and procedure has a description of what the product/procedure is used for, what treatments will consists of and what to expect. Once a woman begins to see the signs of aging, what steps should she take to prevent further damage? Unfortunately, part of aging is genetic process that we all must face, but this doesn't mean that we can't control it, reverse it or slow the clock down. Other parts of aging, or factors that will accelerate the process include sun exposure, nutrition and environmental factors such as smoking. Sunscreens prevent aging and protect the skin and collagen, good nutrition helps the body maintain the skin and its collagen. There are laser treatments and fillers that are also wonderful for either maintaining healthy skin or reversing visible signs of aging such as wrinkles, brown spots of loose skin. Topical skin care products such as retinoids or glycolic acid containing products can also help reverse signs of aging. At age 40, I noticed an increase of crows feet and sagging upper lids, what do you recommend as the best treatment to reverse the appearance of those lines and sagginess? The eyes are many peoples' tell-tale factor on aging. Loose eyelid skin can make one appear tired, older or run down. Add a few lines around the eyes and it is intensified. Loose eyelid skin can easily be treated by surgically removing the skin with blepharoplasty surgery. In many cases, this is a simple 1 hour procedure performed under local anesthesia. The excess skin is carefully measured and trimmed to create a smooth refreshed upper eyelid. For earlier or minimal skin laxity of the upper eyelid, a laser can be used to tighten the skin without surgery. The lines around the eyes, crow's feet, can be treated with either botox injections, laser resurfacing or both. The botox relaxes the muscles that are making the lines and helps smooth the skin. Laser resurfacing removes old damaged collagen, smoothes out the lines, tightens the skin and removes any pigmentation that might be associated. Botox injections are repeated every 3-4 months and laser resurfacing is generally a one time procedure with results that last years. What should women of any age do to protect their skin from premature and normal aging? Sunscreen and moisturizers are the two easiest and most important preventive actions that can be done. Sunscreens protect skin from the harmful effects of UVA and UVB that can damage collagen and elastin leading to wrinkles and also cause unwanted pigmentation. With so many products such as fillers, Botox, laser surgery and so forth, what procedure do you use the most for your clients and why? Every treatment is geared towards providing patients with the right treatment or combination to meet their needs and wishes. In our practice we offer the full spectrum of non-surgical to surgical treatments along with around 20 lasers. We take pride in being able to offer all options and not to pressure our patients to do treatments. We offer a comprehensive consultation and evaluation and then offer the appropriate treatments or combinations. These days, many people prefer to do a combination of smaller procedures in order to possibly avoid a larger procedure or to avoid the healing time of surgery. In many cases, this is appropriate and we can offer this alternative to them. The advances in laser technology have provided us with the ability to improve results, with safer treatments and minimal downtime. If these minimal downtime procedures are not appropriate and surgery is indicated, then we take pride in providing the latest techniques and the highest quality. What are your experiences and thoughts on Botox? Do you feel there could be long term implications in using Botox such as permanent droopiness of the lids? Botox has an incredibly safe record. Complications from the cosmetic botox injections are very rare and short-lasting. Drooping eyelids are from the botox being placed too close to the eye and will subside when the botox wears off. In properly trained hands, Botox or Dysport can do wonders to rejuvenate the face by reducing lines, and even elevating the eyebrows for a more alert refreshed look. When choosing a dermatologist, what should you look for in terms of qualifications? With any physician, Board Certification in their specialty is a fundamental but important point to look for as an absolute minimal criterium. Beyond this, you must look at the background training, such as the institution of residency training, expertise beyond the specialty, either double board certification or additional education may be a factor. Is the doctor a cosmetic doctor, a clinical doctor or both are also important questions depending upon the patient's needs. Even beyond this, you must look into what sort of practical experience a doctor has and what sort of applied expertise he or she has to offer. What products do you recommend on a routine basis for women and men to use at home? The three basic products are an oil-free moisturizer to nourish and hydrate the skin. Second, sunscreen is very important to protect and prevent UV damage resulting in fine lines, wrinkles and discoloration. Third, a retinoid product such as Tretin X, Renova, Tazorac or Avage. These products have been clinically proven to reverse sun damage, reduce fine lines and wrinkles, reduce pigment and rebuild collagen in the skin. Beyond this, there are other products containing growth factors or antioxidants that may provide extra benefits. The most important concept that patients should remember is that every person's needs are different. A beauty consultation should consist of evaluating a patient's skin and facial structure, listening to their needs and desires for areas of improvement. Once the evaluation is complete, various treatment options including topical skin care, laser and light therapy, fillers and or surgical procedures that can meet these needs can be discussed and an individualized treatment plan is developed. I would like to thank Megan and Dr. Fincher for this great opportunity to explore the world of aging treatments. You've done it again. This is a really great, information packed post. I think the question about what men and women can use at home is a really good one. I'm scared of the more invasive procedures like facelifts, but using a retinoid product is pretty straight forward. Just have to get a script for the industrial strength stuff.